Data Dependencies are typically associated with a Data Collection Trigger in order to ensure that data is available and current in the source system through the collection cycle specified in that Dependency. Check that data in a Warehouse Customer Order table contains records post midnight of the prior day (which indicates that all of the prior day's orders have been loaded). Verify that an ETL control table specifies that ETL processing has been completed since the last data collection cycle. Verify that volume in a data table is at least X% of the volume of data in a prior day as a data qualify check before loading data. 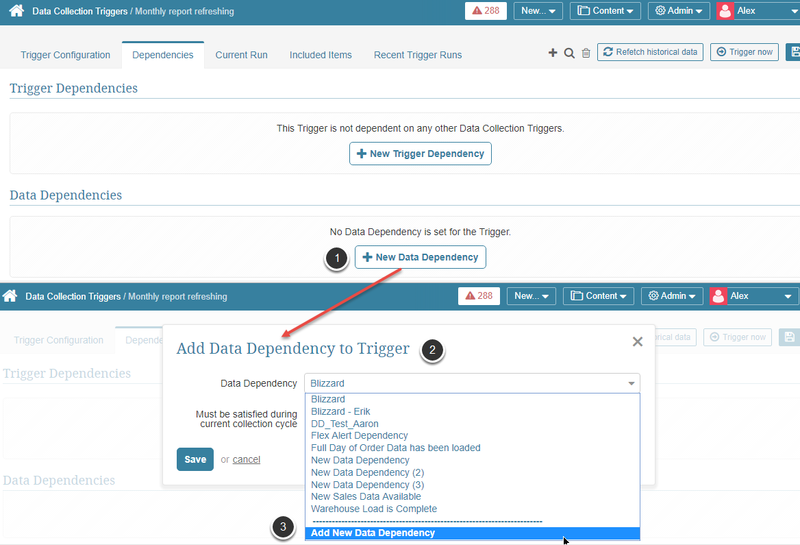 From the drop-down list select the Add New Data Dependency option. 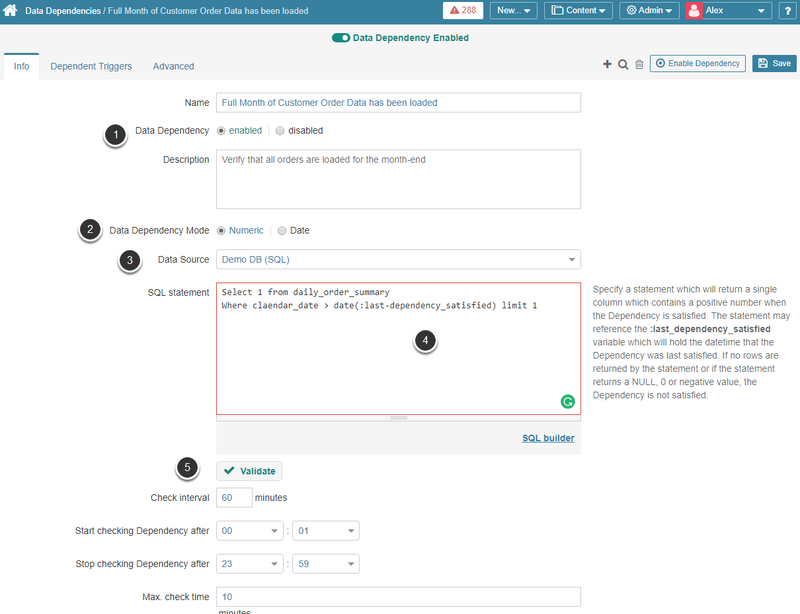 After the new Data Dependency is saved, the Data Dependency Editor opens. In 5.1+ a new Data Dependency Mode field was allow a simplified SQL. If set to 'Numeric", the system expects the same SQL statement as in prior versions, see Hint on right of statement box above. If set to 'Date' then your SQL hint will change to: "Specify a statement which will return a single column which contains a datetime value. The dependency will be satisfied if the value returned falls after the datetime on which the Dependency was last satisfied. You may optionally also specify the Table Name for the query." Specify how often the dependency check fetch command should be run. Provide a time window during which checks should be performed. Specify a time period after which the dependency check should be expired. Enable Dependency at the top right corner of the screen. If your Data Collection Trigger's interval is an hour or longer, you can control the circumstances under which an associated Data Dependency must be satisfied by accessing the Data Collection Trigger Editor and editing an existing dependency.